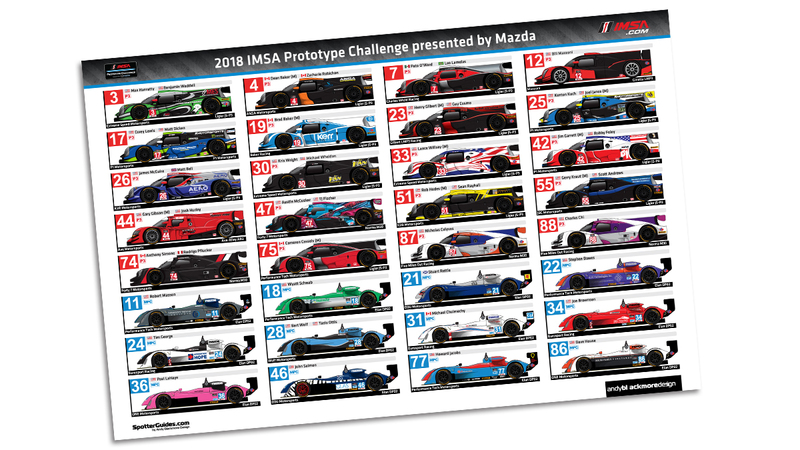 Welcome to the official IMSA Spotter Guide for the IMSA Prototype Challenge presented by Mazda. This is a season long guide which includes all the full time entries along with a few which are expected to compete in most of the races. The series features two classes of car, the LMP3 and the older Panoz ‘MPC’ open cockpit cars. You can follow race coverage at IMSA.com/ IMSA.tv and through the IMSA app. You can also download a combined Spotter Guide (19Mb) featuring the WeatherTech, Continental Tire and this Prototype Challenge guide HERE. A printed version of the guide (not featuring #12 as this was a late entry) will be available in the Prototype Challenge paddock during race weekends. Thanks to IMSA for partnering with the guide. If you get a few seconds, please thank IMSA on Twitter. Without their support, there would be no guide. Thank you to all the teams who have helped with creating the guide.